The crowd chanted "Freedom" and "Revolution", and appealed to soldiers to protect them, witnesses said. 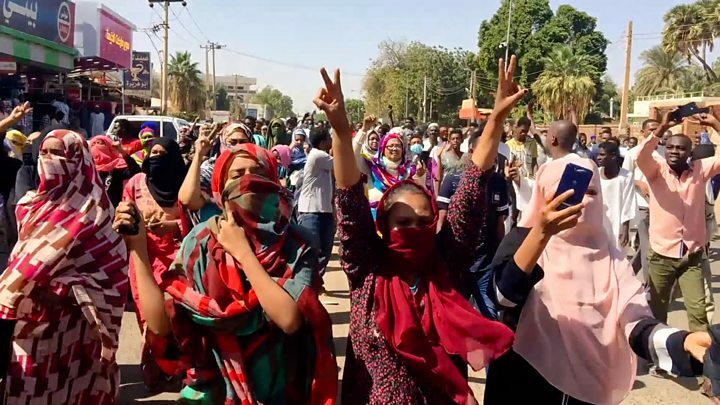 The Sudanese Professionals' Association (SPA) which has spearheaded the protests, urged supporters to foil any attempt to disperse the sit-in. On Sunday the transitional military council sought to appease protest leaders, telling them that key figures from the former government had been arrested. It is not clear who those officials are. A military spokesman also promised not to disperse protesters and said the council was "ready to implement" whatever civilian government the opposition parties agreed. In another development, 13 people were reportedly killed in an armed attack on protesters in the troubled region of South Darfur over the weekend. "Gunmen" attacked the anti-government protest at a camp for displaced people about 17km (10 miles) east of the regional capital, Nyala, according to the privately owned Darfur 24 news website. Mr Bashir has been indicted on charges of war crimes and crimes against humanity in Darfur by the International Criminal Court. He denies any wrongdoing. Amjad Farid, an SPA spokesman, told the BBC that they "completely rejected" the military council currently leading Sudan. He said demands included the "full dissolution of the deep state" and the dismantling of state intelligence agencies. Opposition politician Mubarak al Fadil told the BBC that the role of the military should decrease over time. Meanwhile, protesters in Khartoum remained in defiant mood. "We are here to remove the entire system, a system that does not give service equally to the people," Mohammed Jakur told AFP news agency. "A system that leave[s] people under poverty. A system that does not allow Sudan, as a rich country with human and natural resources, to act as any other country in the world." Huge change has come to Sudan in just a few days, but the street protesters want more - to ensure the risks they have taken will shape the future of the country. At this point trust is hard-won and easily lost. If those still demonstrating outside the military headquarters are forcibly dispersed, that trust will be shattered, as the transitional military council has promised this will not happen. Many concessions have already been made - the arrest of former government figures, new heads of the army, police and the security service, and a promise the opposition can choose a new prime minister. The question is where the line is drawn - between where the demonstrators are satisfied their demands will be met, and the point when the military leaders feel they cannot give any more. What has the military said? In a news conference on Sunday, spokesman Maj Gen Shams Ad-din Shanto said the military council was "ready to implement" whatever civilian government the opposition parties agreed. "We won't appoint a PM. They'll choose one," he said. He also said the army would not remove protesters from their sit-in by force, but called on the crowds "to let normal life resume" and stop unauthorised roadblocks. It was formed in 2016 and includes an array of professional groups including doctors, lawyers, journalists, university professors and engineers. 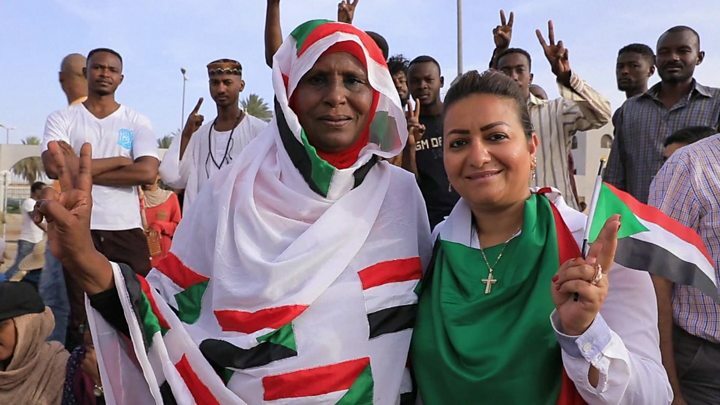 The pro-opposition umbrella group says it was established to counter Sudan's mainstream trade unions which stood accused of being pro-government. In 2018, with inflation rising and the value of the national currency falling, the SPA was at the forefront of campaigning for a national minimum wage. Media captionSudan protests: So what's going on? But its profile was raised on 1 January when it published a Declaration of Freedom and Change, calling for "the immediate unconditional departure of Bashir and his regime". It has since listed more than 20 civil society groups and opposition parties that have signed up to the declaration. Although it has taken on a more political role, it has no organisational structure and holds no records of the number of its members, SPA spokesman Mohamed Youssef al-Mustafa told AFP news agency in January. Its website lists no leaders, only a number of spokespeople. In recent months the group has used a Facebook page to publish a weekly schedule of planned protests ranging from sit-ins to marches. What's the background to the protests? Demonstrations began in December over a steep rise in the cost of living but soon developed into a wider call for the removal of Mr Bashir and his government. Then last Thursday the military removed and detained the veteran leader after nearly 30 years in power. Coup leader Defence Minister Awad Ibn Auf announced the military would oversee a two-year transitional period followed by elections and imposed a three-month state of emergency. But demonstrators vowed to stay on the streets unless there was an immediate switch to civilian government. Mr Ibn Auf himself stood down the next day and was subsequently sent into retirement. Mr Bashir's whereabouts are unknown, but military leaders said he was in a secure place. The military council has said it will not extradite Mr Bashir to face accusations in the International Criminal Court, although he could well be put on trial in Sudan.